One of my favorite things to do after dinner is walk around the city in the fresh air in search of a good dessert. 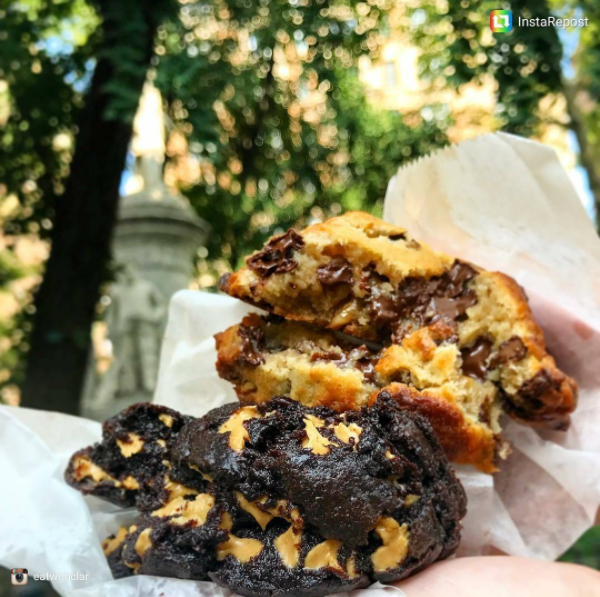 There are so many places to get a delicious treat in New York, but here are five you should put on your list immediately! Have you tried green tea ice-cream? It's one of my very favorite flavors! Whether or not you've tried it, head to Taiyaki in Chinatown for a scoop in a fish-shaped cone. There's a lot of great baked goods at Le Pain Quotidien, but the absolute best thing is the Belgian waffle with melted chocolate. It's so simple but so delicious. The best part is that the chocolate isn't super sweet like Nutella, so it isn't an overpowering or saccharine dessert. It's especially good with an iced chai. Out of all the flavors of gelato at Eataly, I adore the banana chocolate chip. It feels like a classic, but the banana flavor gives it a unique twist. Just a small cup will be enough for an after dinner treat! If you haven't tried an egg cream, head to New York and find one immediately. A great bet is Brooklyn Farmacy in Carroll Gardens. They have several egg cream variations, but go for the classic option. It's just carbonated water, milk, and chocolate syrup but it is so delicious! Pair with a grilled cheese if you'd like. The cookies at Levain Bakery are famous for their huge, chewy almost doughy cookies. Try the chocolate chip walnut cookie with a big glass of almond milk or lemonade.